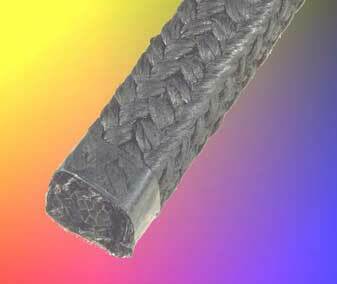 A high purity, high performance, graphite fibre packing for both valve and pump applications. K44 is only one of the extensive products in the KLINGER pump and valve sealing range. The range includes compression packings, moulded sets, low emission sets and specialised products. The result is the KLINGER pump and sealing range. K44 is produced from a high purity graphite yarn that KLINGER then lubricate with a special dispersion. Klingerlock braiding produces a packing that is consistently dense with excellent volumetric stability. The result is an excellent graphite packing offering reliable sealing performance in both valve and pump applications. The additional lubricant improves the packing’s overall capability in dynamic applications and also acts as a blocking agent to improve sealing. powerful oxidisers. Although frequently employed on its own, the packing can be used as part of a specialised composite set in conjunction with either K3222 packing or K35 dieformed rings. Within these sets K44 acts as both supporting anti-extrusion rings and wiper rings.